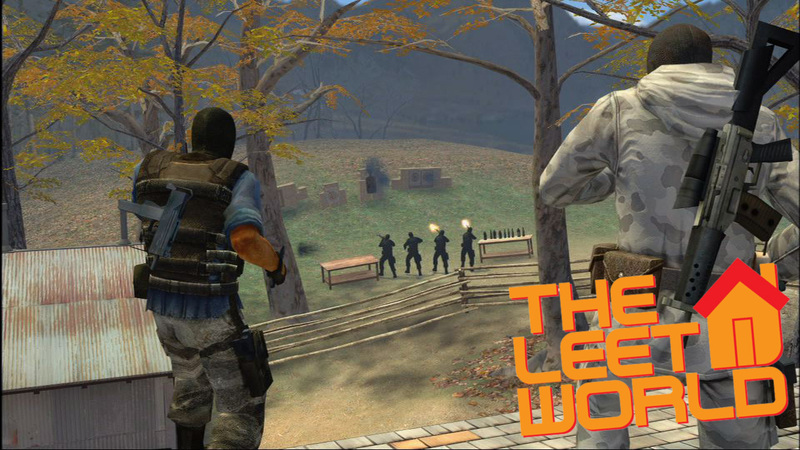 Another screenshot from The Leet World Season 3. This time, Montrose finds himself in a rather precarious situation. Who are these masked CSGO baddies? What do they want? And just how is Montrose going to get out of this predicament? Perhaps his boots will have some part to play. *The world will totally actually know, when the episode featuring this scene is released. This entry was posted in Extras, News, Screenshots, TheLeetWorld and tagged leet world, screenshot, season 3 on August 27, 2015 by Eddy. Here we go, ladies and gents. 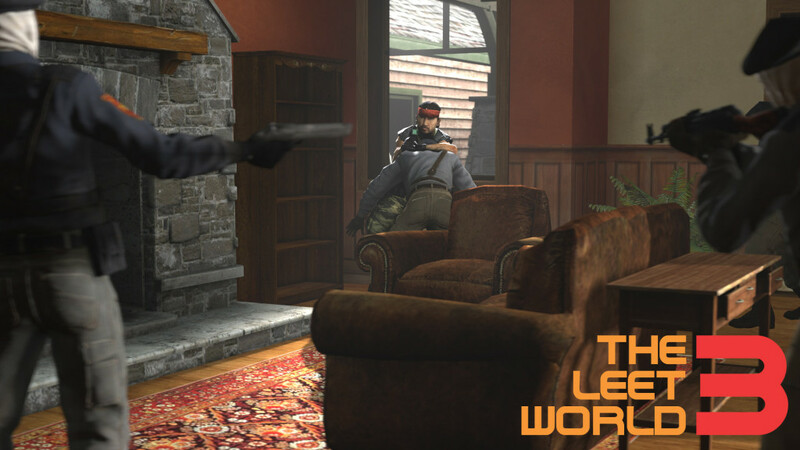 Another Leet World Season 3 screenshot. This one is actually from Episode 2, and shows a gathering of more than one character you might recognize. One of them is a sassypants, and the other loves burros. Things are still progressing, although a bit slowly at the moment since my wife and I (hi, Diane) just had our second little girl and Daniel is off in Japan having samurai sword fights. We hope to have a bit of a teaser ready for you guys in the near future, where you can actually see some of these guys both walking and/or talking. Maybe even both at the same time! This entry was posted in Extras, News, Screenshots, TheLeetWorld and tagged leet world season 3, screenshot on March 26, 2015 by Eddy. It’s been a long time since I’ve posted a screenshot of an upcoming episode of The Leet World. We’ve been keeping mum on the show as much as we can since it’s still quite a ways out, but we’re starting to hit that point where we can give you guys a few glimpses and teases. Part of that is due to the nature of working in a new medium — we’re still trying to work out some of the kinks of Source Filmmaker. And part of that is we want to do as much as we can to make the show still feel like Leet World even though the characters are capable of new things, like karate chops. Speaking of. 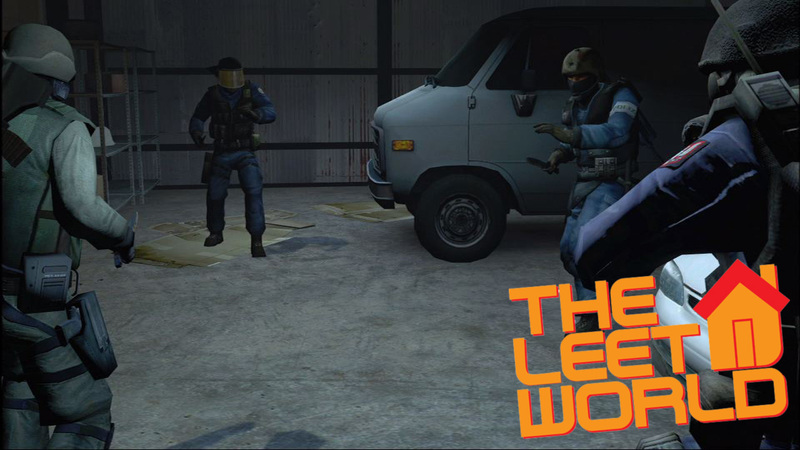 Episode 1’s got a few familiar faces in it, and Leeroy just happens to be one of them. He’s mighty concerned about something. This entry was posted in Extras, News, Screenshots, TheLeetWorld and tagged Leeroy, leet world, screenshot, season 3 on January 29, 2015 by Eddy. Lots going on in these parts of the webisphere. We’re hard at work on the Season Finale of The Leet World, pushing through to get it done in a timely and awesome manner. I know that last week I said it would be coming out in two installments on our website. Well, sometimes I’m a lying liar. Fact of the matter is, the episode is getting so big and burly that we’re having to add another installment to it, meaning that the finale is going to be an epic three part release. Each part will come one week after the next, meaning you get three straight weeks of episodic bliss. You may be thinking to yourself, “huh?”, but trust me, it’ll be a lot of fun this way. Seriously, this thing keeps growing like some sort of digital black hole that consumes all in its path. Not even roflcopters can escape its mighty pull. And they are web vehicles of the fastest sort. Below are the first screenshots of the Season Finale. Lots of dudes and things. Remember to vote for the Themetacular Challenge! There may or may not be lulz coming later this week. Lulz is code for Episode 13 audio outtakes, if you’re wondering. It’s not a very good code. 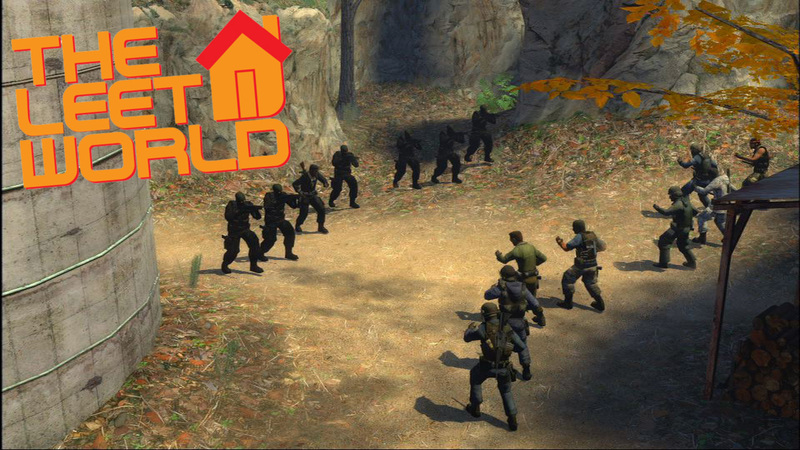 This entry was posted in Extras, News, Screenshots, TheLeetWorld and tagged counter-strike source, css, Episode 13, episode 14, Machinima, Outtakes, screenshot, Season Finale, the leet world, TheLeetWorld, themetacular on May 28, 2008 by Eddy. If you’re here for Episode Two, scroll down, or go to the episodes page. So far, we’ve been hearing great things about this one- as I said before, we’re overall much happier with how it came out compared to Episode One. We’ve already started on the next installment, which should be a tad easier to film. The second episode just hit machinima.com, spikedhumor.com, and youtube, so be sure to vote for us if you feel like it. And keep spreading the word about the show. Nick put this nifty little poster together for “Dirty Deeds”, so I thought I’d post it here, even though I already stuck it up on the forums… Click on the thumbnail for a larger version. Stay tuned to our site, because early next week we should be putting out a small preview of Episode Three. More than just a screenshot this time. Going to be playing some Bioshock this weekend. Very excited. Episode Two’s release kept me from opening it- but nothing will stand in my way this time! This entry was posted in Extras, Maintenance, News, TheLeetWorld and tagged Bioshock, Dirty Deeds, Episode One, Episode Three, Machinima, poster, screenshot, spiked humor, Youtube on August 24, 2007 by Eddy. For those of you checking on the status of The Leet World, you should know that filming on Episode 1 is currently underway, and moving along quite well. While we are going to keep things under wraps for the time being, you should know that some great things are happening as far as the look of the show…We are currently both filming and capturing at a native 720p resolution- that’s right, things will be very pretty. And it looks awesome. Here’s a screenshot, if you’re not convinced. You should notice our logo in the lower right hand corner, as well as the fact that in comparison to the way we’re shooting the show now, the trailer looks crude. Next week, we’ll post some pictures of the production process, and maybe another screenie or two. 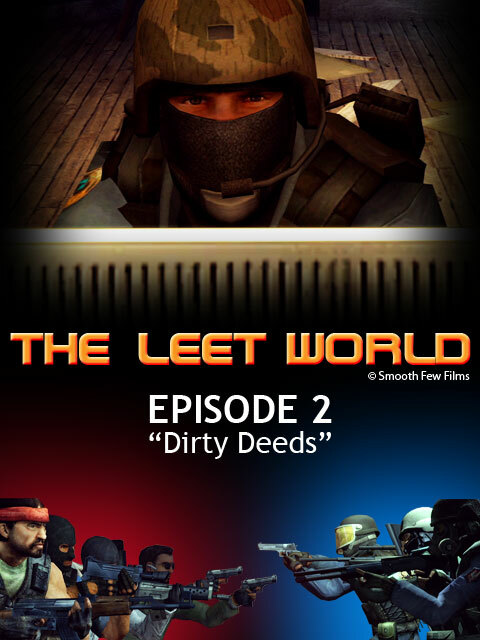 This entry was posted in News, TheLeetWorld and tagged Episode 1, screenshot, the leet world, TheLeetWorld on July 5, 2007 by Eddy.